From the very beginning of her career, Krystel Huxlin has looked for big problems to solve. Now she’s doing something about a very big problem indeed: Loss of vision after a stroke or brain injury. Even more frustrating for Huxlin is when applications for disability are challenged because a stroke or injury victim “still has” a 50 percent field of vision. With only a 50 percent field of vision, it’s difficult to spot a car coming from the right or left, to detect objects, to navigate through an airport, and even–especially if the “blind area” is to the right of center—to keep your eye anchored on the line of a book you are trying to read. “All of these things become excruciatingly difficult,” Huxlin says. Huxlin has developed a “physical therapy” for the visual system—a set of exercises that stimulates use of visual information by undamaged portions of the visual cortical system. With repeated stimulation, these undamaged portions can learn to effectively process visual information that is not filtered by the damaged primary visual cortex, partially restoring conscious visual sensations. How? With a simple, computer-based device that requires vision-impaired stroke victims to fixate on a spot in front of them. Then, without shifting their eyes from that spot, they are asked to describe small circles of striped patterns or moving dots that are flashed in their blind zone. At first, they may see little, perhaps only just “sensing” the stimuli. But eventually, her studies show, the patients are able to actually “see” them and describe them relatively accurately. Their visual system has re-learned to interpret a visual signal from their blind zone. Huxlin’s device includes multiple improvements over previous eye-training systems. For example, it incorporates eye tracking to ensure that patients aren’t inadvertently “cheating” by turning their eyes toward the stimuli. The technology has been patented and licensed to Envision Solutions. The company is currently running a three-site clinical trial with the technology. Huxlin is also collaborating with Gabriel Diaz’s PerForM Lab in the Chester F. Carlson Center for Imaging Science at nearby Rochester Institute of Technology to develop virtual reality headsets with integrated eye tracking that patients could use at home—rendering in-home, long-term therapy as effective as it is when it’s performed in the Huxlin lab. When Huxlin first came to Rochester in 1995, she intended to stay only two years. Born in Romania, she moved with her family to Belgium at age four, and then to Sydney, Australia, at age 13. After Huxlin finished high school, the British education system in Australia enabled her to go directly into the University of Sydney School of Medicine to pursue BS and PhD degrees in neuroscience. “Right away I went looking for labs to do research in during my spare time,” she says. 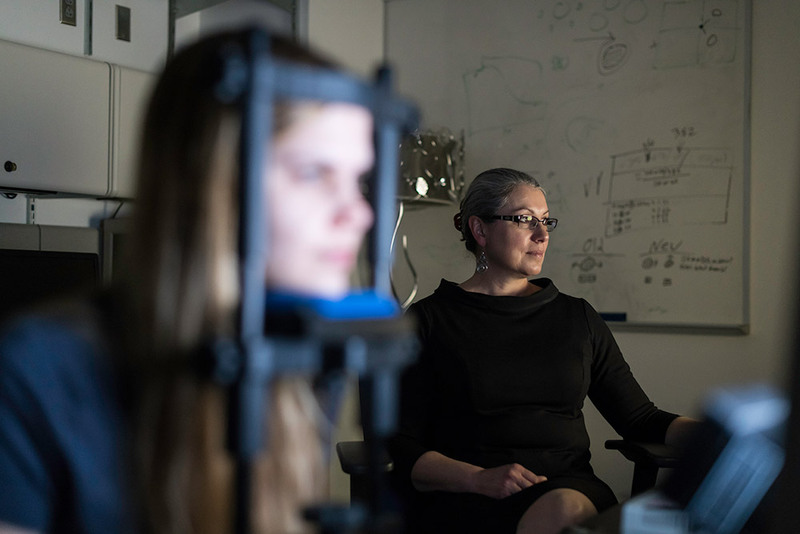 Fortunately, she was welcomed into the lab of Ann Sefton, a vision scientist who has done pioneering work both in understanding how visual information is regulated as it passes from the eye to the cerebral cortex, and in describing how visual centers of the brain are formed during development. During six years of undergraduate and PhD studies, Huxlin gained an understanding of the visual system, then developed animal models to help study eye damage in the lab. She culminated her studies with a prestigious, four-year C.J. Martin Early Career Fellowship, which allowed her to spend the first two years overseas. She came to the University of Rochester to study with William Merigan and Tatiana Pasternak, professors of ophthalmology, neurobiology and anatomy, and both long-standing members of the Center for Visual Science. And then she met her husband—Keith W. Nehrke ’94, currently a professor of medicine in the Nephrology Unit. She forfeited the last two years of her fellowship—and stayed at Rochester. She has no regrets. “I became plugged in immediately with the Center for Visual Science, which has been vital to me and my work,” she says. The center, founded in 1963, consists of nearly 40 University of Rochester research labs, including faculty from seven different departments. 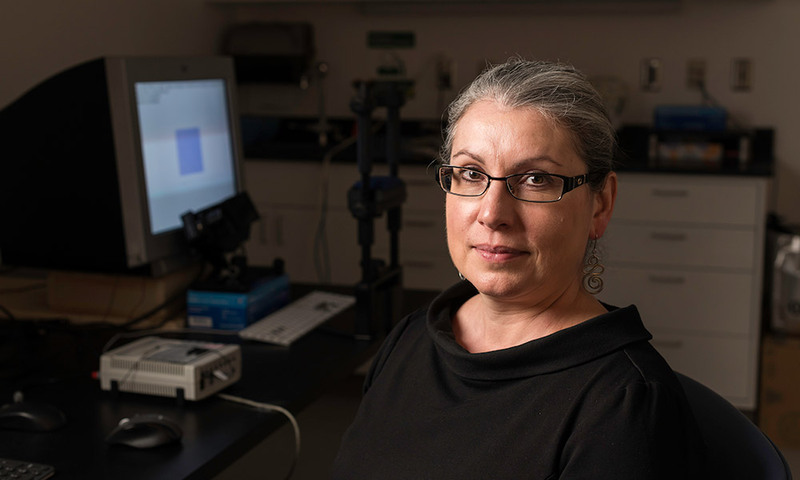 Indeed, her subsequent work with the center and several of its members, including current director David Williams, the William G. Allyn Professor of Medical Optics, led to a collaboration that may transform the way human vision is corrected. At the time, the group was working with Bausch and Lomb and Scott McRae, the University’s Lasik surgery expert, on ways to improve the procedure. They invited Wayne Knox, a professor of optics, to describe how he was using femtosecond lasers–at high repetition rates, low pulse energies–to change the properties of hydrogel materials in ways that altered their refractive index and wave-guiding properties. But Huxlin thought of something else. Knox agreed to give it a try. Now, some 10 years later, the technology is licensed to Clerio Vision. The startup is continuing to work with University researchers to develop the technology so that it can write individually customized vision corrections into not only contact and intraocular lenses, but directly into patients’ corneas. Critically, it can accomplish the task without any of the flap-cutting part of the current Lasik surgery that prevents many people from electing to have the procedure. The procedure can be done in a minute or so. And, in theory, it can be done again, and again, as individuals age. Equally exciting, she says, is the impact the technology will have on contact lenses. A company will no longer need to keep huge stocks of lenses with “plus one, minus one, plus two, minus two with x amount of astigmatism,” Huxlin says. “You just measure the full complement of aberrations in any individual eye, then write it into a blank contact lens. And there you, go. Absolutely custom.